When Disney purchased Marvel Comics a ton of very talented people jumped to their drawing boards and started creating mash-ups involving the two company’s characters. Images of Mickey Mouse webslinging through the skyline were all over the place. But it was all in good fun, no one actually expected it to actually lead to anything. But it did lead to something. A mash-up I would have never expected in a million years. 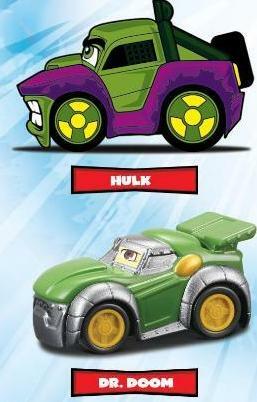 Disney is crossing Pixar’s Cars with Marvel’s Superhero Squad. 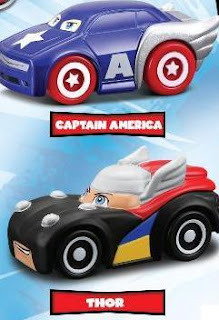 Now I’m not saying Cars 2 is going to have a Captain America cameo. Mater isn’t going to roll onto the next season of the Superhero Squad. As far as I can tell, this cross over is happening entirely in the toy isle. In that regard it makes certain sense. The Cars line has been incredibly popular. The Superhero Squad stuff has been around for a long time, but has really seen a boost due to the cartoon. So they’re taking two properties that are already strong sellers and smashing them together. Is it chocolate and peanut butter? I suppose you have to make that decision for yourself. In a very odd way they kind of make sense. Sure, turning Silver Surfer into a talking car is strange. But when you think about it, does Spiderman need a Formula 1 race car with his face on it? 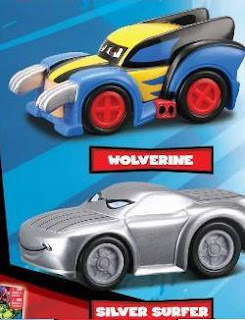 Do you see Wolverine driving around in a bright blue tank with his name down the sides? There are cars made for Daredevil, I don’t care what his superpowers are, that’s scary. 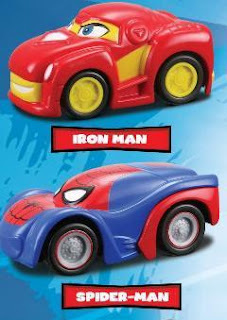 I’m more willing to believe there is an alternate dimension where everyone is cars than I’m willing to believe Iron Man will ever need to use a yellow and red bi-plane with his picture painted on the wings. The first wave is full of Marvel marketing’s usual suspects. Iron Man, Spider-Man, Captain America, Thor, Wolverine, Silver Surfer, Hulk, and Dr. Doom. The Thor car was really bothering me for some reason and it took me a while to figure out what I didn’t like about it. It’s all the flash color. Dr. Doom is the only other car to have it and he only has a tiny bit around the eyes. Thor looks more like someone pushed his head into a tiny car. Captain America actually looks pretty cool with the wings in the back. The company that makes these guys is named Maisto and you can check out there website here. Follow the link and you can see all the stuff they have planned for this year. In addition to the Marvel cars they also have the traditional, check out this cool car with Spiderman painted on the side. So if you don’t like this mash-up and still need your superhero car fix you can still get a green van with the Hulk on it. I have no idea when these guys are going to start showing up on shelves, but I have a feeling they’ll sell pretty well. Hopefully they’ll do well enough that we’ll eventually get an Iron Fist.